Evidence of Brain surgery from Harappa. in the form of a visible linear depression, probably resulting from a severe blow. . . There is evidence too of healing indicating that the victim survived for a considerable time after the operation. 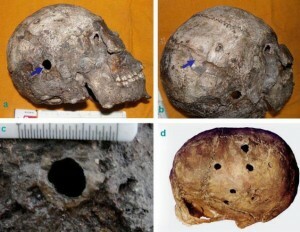 Scholars have recorded striking similarities in trepanation techniques across the continents, and therefore consider it as important evidence for prehistoric movements of people and for transfer of surgical skills from one society to another. There is another reference to Brain surgery in 11th century in a text Bhoja Prabandham, describing life of Raja Bhoja. Early in his career, just before he came to power, Bhoja was afflicted by a tumor in his brain which used to cause him intense headaches. Two learned Brahmin brothers from the school of Ujjain, who were pre-eminent surgeons of the era, performed a surgery on his brain and relieved him of his tumor. The description of the surgery that survives suggests that they artificially induced a coma with a special preparation known as the sammohini and then opened his skull to remove the tumor. He was then brought back to consciousness with another drug. — with Aaina Allin, Atul Bele, सौरभ काकडे, पांगरीचा मारुती, Mandakini Kapoor, Brien Foerster, Bhausaheb Ware, Silvio Pablo Gonzalez González and Raam Naim Kaktus. Even before 11th century when Raja Bhoj was operated, during 4th century B.C. Jivaka the physician contemporary to King Bimbisara performed craneotomy. The Vinaya Pitaka gives all the details of the case record. Surprisingly we neglect the incidences which are not quoted in the Hindu Medicine literature.